The celebration of the 10th Anniversary of Campus Sustainability Day (CSD) needed a topic appropriate to a moment in time when campuses have shown that the impossible is possible – changing the way they teach, operate, build, and plan in order to reduce emissions and prepare students to lead a just and sustainable future – while recognizing the challenges and opportunities still present in their journey to integrating deep sustainability education. This year, Second Nature and the CSD supporting organizations, including AASHE, the National Wildlife Federation (NWF), The Society for College & University Planning (SCUP), USGBC, Focus the Nation, Tree Campus USA, the SEED Center, and IDEAS, are calling on campuses to participate in a national day of dialogue around a critical question which invites conversation on both success and continued roadblocks: How is higher education preparing students for a changing climate? Campuses across the country are organizing discussions to gather input from students, faculty, and staff on the best practices and remaining challenges for providing students with the skills and experiences they need to prepare for a changing climate, society, and economy, using three guiding questions to form a common national dialogue. Join thought leaders in campus sustainability as they discuss best practices and challenges for preparing students for a changing climate, with an emphasis on curriculum, research, and experiential learning. Featuring Geoffrey Chase, leader of the Ponderosa Project, Julie Elzanati, Director of the Illinois Green Economy Network, Julian Keniry, Senior Director of Campus and Community Leadership National Wildlife Federation Campus Ecology Program, Neil Weissman, Provost of Dickinson College, and Debera Johnson, founder of the Partnership for Leadership in Sustainability, this panel invites questions from the audience to discuss best practices for creating ecological curriculum, advancing experiential and living laboratory learning, and engaging faculty and the surrounding community in meaningful and critical education. This is a live, interactive event! Panelists will base their discussion on questions provided by you – the audience – during the panel, and will be screened using live video in Google+ Hangouts on Air. The panel will be screened live to Youtube – no special login or software is necessary to watch, and you will be provided with the link after registration. To ask questions, you will need a Google or YouTube login to leave comments on the video as a question for the panelists. Institutions are encouraged to participate in the keynote broadcast as a way to jumpstart regional conversations. How are you preparing students for a changing climate? We want to hear from campuses across the country, and gather input from students, faculty, and staff on the best practices and remaining challenges for providing students with the skills and experiences they need. Host a conversation on campus, gather for a virtual conversation with campuses in your region, or tune-in to one of the regional conversations organized in your area. What is your college/region doing to prepare students for a changing climate? Where do challenges still exist for your campus/region in creating successful sustainability and climate programs, and what are the solutions to these challenges? How can your campus/region ensure that all students acquire the skills and education necessary to prepare for a changing climate, society, and economy, regardless of their course of study or career goals? For questions about Campus Sustainability Day, please contact Sarah Brylinsky, Program Associate, Second Nature at sbrylinsky@secondnature.org. The University of Arkansas Office for Campus Sustainability is changing. We have new members on board including an interim-director, five interns, and newly appointed executive director for Campus Sustainability, who will report directly to the provost. Via Dave Newport’s blog on the Death of Campus Sustainability, we see a changing tide of sustainability in higher education across the nation. Technologically, we’re seeing new social media platforms rising (think Klout, Kred, Pinterest, and Google+). Change is scary but our office is using it to our advantage. 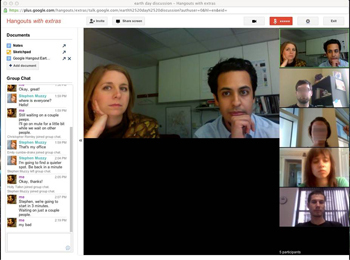 In March, our office held our first Google Hangout via Google+ to discuss Earth Day 2012 on college campuses across the US. We openly invited people from every listserv and outlet we know to participate in a free videoconference on Google+. Several sustainability folks in higher education participated in the event. Emily Cumbie-Drake from Emory, Chris Remley from Carleton College, Steve Muzzy from Second Nature, Shannon Remley from the University of Arkansas Applied Sustainability Center, and a RecycleMania intern and I represented the UA Office for Campus Sustainability. There’s a slight learning curve that prevented several people from participating and that’s okay because there’s more to this story than new technological innovations.